Being a mother of two young boys can cause you to think that you no doubt need a lesson in anger management. I suppose having children of any age can also induce that feeling. I have a short fuse to begin with, add in screaming, yelling, and just plain racket and you get a really messy situation. I have never endangered my kid's welfare nor have I seriously tried to hurt them. 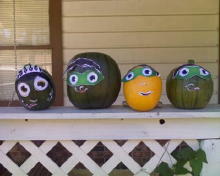 I can remember one day I thought it would be nice to decorate pumpkins with the kids and their cousins. So here I am with two two-year olds, and two five-year olds. We cut out things to glue on the pumpkins and then tried to glue them to the pumpkins. All the while they were running and throwing the pumpkins. I tried really hard to keep my calm and remember that I asked for this. At the time all I wanted to do was rant and rave and yell at them. I wanted to tell them to go sit in the corner like a bunch of statues. Then I calmed myself and tried reminding myself that they are only children and that is what they do for fun. I have always said that some things are better remembered than experienced. I look back and think it was a good thing. Thanks for this, Suzie. Your story will help others to remember what is really important as parents. I love your line, "they are only children and that is what they do for fun." And thanks for that great photo! I raised two boys, too. Hi. I loved your story. I raised two boys also, so I related to what you were saying. They can be a trial sometimes. For the most part, my two sons were wonderful. When I look back on it, I didn't have a whole lot of trouble with them. They didn't get into drugs, they didn't become alcoholics, and they were very respectful towards me. However, there were times when they were at each others throats. I used to wonder, "Is this normal?" Often I would look at each of them separately and say, "This is your brother. He is the only brother you will have. Can't you guys get along?" When they were still young I started taking them out separately to dinner sometimes. I would take turns taking one out to dinner one night and the other one out to dinner the next night. That way they could each have their say about the other without being interrupted. I would also take them for drives in the car and when I was on a straight road without a lot of other people around, I would let them both scream at the top of their lungs. (It's best to have your window cracked a bit so that the noise doesn't deafen you.) I thought that this would be a good way for them to get their anger out and release any pent up frustrations they had. It usually worked. By the time we got back home, they were calmer and got along better. I also got into the habit of turning the TV off for at least an hour a day and ask my sons to tell me what was happening in their lives. I would just quietly listen to them without interrupting or giving them any advice. Every once in awhile I found myself hearing some things that I'd rather not know, but for the most part, it was really great to hear what they had to say. It helped me as a mother. I read a lot of books about parenting and listened to a lot of recordings about parenting. I wasn't a perfect parent. I stumbled through parenthood and totally looked like a complete fool quite often, but that's just part of the experience I guess. Now, my two sons are grown and they are best friends. They never fight and they tell each other everything. I'm so happy that they have each other. So, if your sons fight sometimes, or act rowdy, other Moms have been there. I think it's a part of growing up. I came from a family of eight children and the stories I have about the things we got into would make your head spin.